Let’s take a trip back to 2002, shall we? The day was Friday, May 3 and I’d gone into work and quickly developed and “illness.” After going home “sick”, I’d ventured down to the movie theater where my plan was to see Sam Raimi’s Spider-Man. As I approached the theater, I noticed a line that wrapped around the block. “Don’t these people have jobs?” was my knee-jerk reaction (and I was totally oblivious to the fact that I too was there). Patience has never been one of my virtues and after seeing the line I decided to go play golf. I eventually saw the film, loved it and liked the two that came after it. And then Sony decided to reboot the franchise. Ok, I’m game – bring on Andrew Garfield and Emma Stone! While I still preferred Tobey Maguire version of the famed web-slinger, there were elements to the “new” version that I liked as well. But then…there were only two movies. What gives? For reasons that I don’t know or am too lazy to look up, Sony decided that Spider-Man is now part of the Marvel Cinematic Universe. I have to assume the reason was financial because, well, it’s Hollywood and things are all about money. We knew this already, of course, since Tom Holland technically made his first appearance as Spidey in Captain America: Civil War. Confused yet? Don’t be. Let’s move on, though. First and foremost, this isn’t an origin story. With five Spider-Man films over the last decade and a half, we all know who Peter Parker is and how he got his “powers”. We’re all well aware that he’s a nerdy high school student that lives with his ridiculously attractive Aunt (Marisa Tomei). The movie wisely skips this. The film takes place just after the events of Captain America: Civil War (obviously). There’s even a moment that shows some “behind the scenes” footage of Spidey’s arrival to the battle. Cool. We meet Peter Parker (Tom Holland), who can barely contain his enthusiasm over his partnership with Tony Stark (Robert Downey Jr.) and the Avengers. Stark puts confidant Happy (Jon Faverau) as his designated mentor, giving him a suit and only allowing Parker to apprehend minor thugs. Trouble, however, has a way of finding Peter and it comes in the form of Adrian Toomes (Michael Keaton), a blue-collar wanna be entrepreneur who’s forced out of business by the Government. Toomes is a bit morally lacking, though, and through a few loopholes manages to turn this into an opportunity. Years later we see that Toomes has adopted the moniker of “The Vulture” and his business is peddling high-tech weapons leftover from the Avengers’ battle with Ultron. There’s the usual High School plot with other friends and a potential love interest, but in the end it’s all about Spider-Man and his (eventual) part in the Avengers. As of this writing, there are two more Spider-Man films planned. And why not? The film was one of the few that delivered with critics and audiences alike. Add to that the popularity of the MCU and you’ve got yourself a winner. Now if they could figure out a way to get the X-Men in there, I’d be a happy camper. But I think the X-Men (and Deadpool) live in their own isolated segment of the MCU. 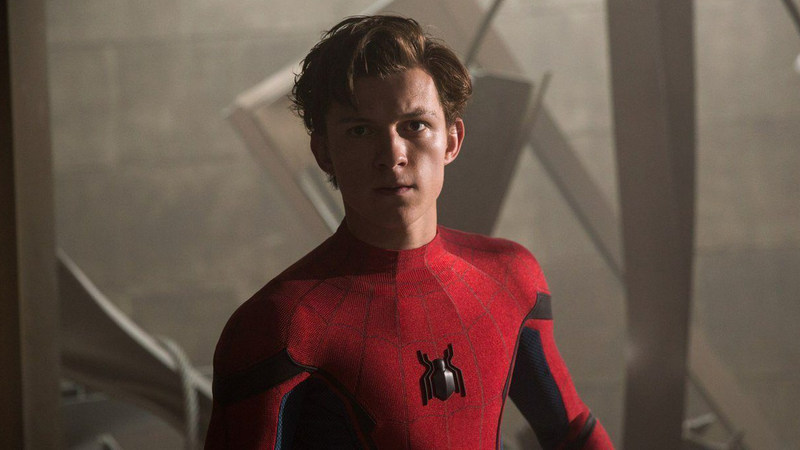 Holland portrays Peter Parker better than both Maguire and Garfield did. Not that they were bad, but with Holland you get the feeling that he’s really a nerdy teen who’s been blessed with superpowers. Emotionally and physically immature, the struggle is real for him and us. Robert Downey Jr.’s Tony Stark is in it just enough to remind us that he’s part of the MCU, but there is such a thing as too much Iron Man. Yes, I just said that. I could go on and on, but I trust anyone reading this will realize that this is one to pick up. Spider-Man: Homecoming swings its way onto Blu-ray sporting a top notch 2.40:1 AVC HD transfer. Interestingly the movie is also available on DVD, 3D and 4K, but I’m assuming those other formats look just as splendid as this one does. Truthfully, there’s nothing to dislike here. The movie doesn’t “feel” like it was made in 3D. It’s one I’d actually like to view in that format. That said, the Blu-ray exudes quality that’s consistent with what Sony puts out. Spidey’s suit shows texture, the digital readout look so lifelike you could reach out and touch them. Colors are wide and expansive, contrast is stark (pardon the pun) and black levels solid. This one won’t get your spidey sense tingling – that’s for sure! It’s a bit disappointing that those of us who got the Blu-ray are cheated out of the Dolby Atmos soundtrack present on the 4K version, but hey – life goes on. Having said that, it’s not like the included DTS HD Master Audio mix is bad by any means. It’s not. Spidey’s webs shoot and it’s a dizzying 360 degree sound that kept my head spinning. Things blow up, Iron Man makes an appearance and his jets engage the LFE. Awesome! Oh and the Staten Island Ferry gets sliced in half. That little incident kept my speakers humming for a few minutes. Like the video, this sounds amazing (wait, wrong movie)! The good news is that the disc has enough supplements where you won’t feel like you’re getting ripped off when you buy the disc. The Spidey Study Guide – This one is for the true fan of our favorite web slinger. The oft-used PIP track contains a slew of references to the comic as well as some things you might have missed. Gag Reel – Shenanigans on the set…Spider-Man style! Deleted & Extended Scenes – An additional 15 minutes of extended and deleted scenes are included, though at 133 minutes the running time was already pretty long. A Tangled Web – I’d mentioned above where I wasn’t sure how Spider-Man got in the MCU. I’d neglected to mention this supplement which does a better job of explaining that than I ever could. Searching for Spider-Man – We get a look at both the character portrayed by Tom Holland as well as Spidey’s place in the MCU. Spidey Stunts – We see some of the stunt work involved as well as Tom Holland utilizing his background in gymnastics for the part. Aftermath – Essentially, this shows us how this movie fits into the bigger picture (pardon the pun) of the MCU. The Vulture Takes Flight – We get a look at the Vulture, Michael Keaton’s performance and some history of the character. Jon Watts: Head of the Class – The film’s director is profiled. Rappin’ with Cap – If you waited for the end cut scene, you’ll recognize that several of these were placed in the film. And yes, that’s Chris Evans reprising his role as Captain America. If you missed the countless references, this movie is part of the MCU. I was a big fan of the first three Spider-Man films. And the second two Amazing Spider-Man films. With this latest reboot it not only shows the enduring popularity of our favorite web slinger, but now that he’s a part of the Marvel Cinematic Universe, it’s just gotten that much better. This one has it all – a good story, a new hero and, of course – Iron Man. What else do you need?